German professor of Hebrew; born 1515; died at Cologne 1577. At first a rabbi at Wetzlar, he was baptized as a Protestant in 1546, but embraced the Roman Catholic faith when called to Cologne as professor of Hebrew, in which office he remained until his death. In 1556 he wrote a popular Hebrew grammar, the last of the five editions of which was published at Antwerp in 1570. He also edited Maimonides' work on astrology (Cologne, 1555) and Moses ibn Tibbon's commentary on Aristotle's "Physics" (ib. 1555; Bartolocci, "Bibliotheca Magna Rabbinica," iii. 912). Isaac's son, Stephan (b. 1542), was at first educated as a physician, but was called as an assistant to his father in 1565, when he became a priest of the Roman Catholic Church. He created great excitement by openly denouncing Catholicism as idolatry from his pulpit (Oct. 5, 1583). In 1586 he wrote an "Apologia," and went over to Calvinism. 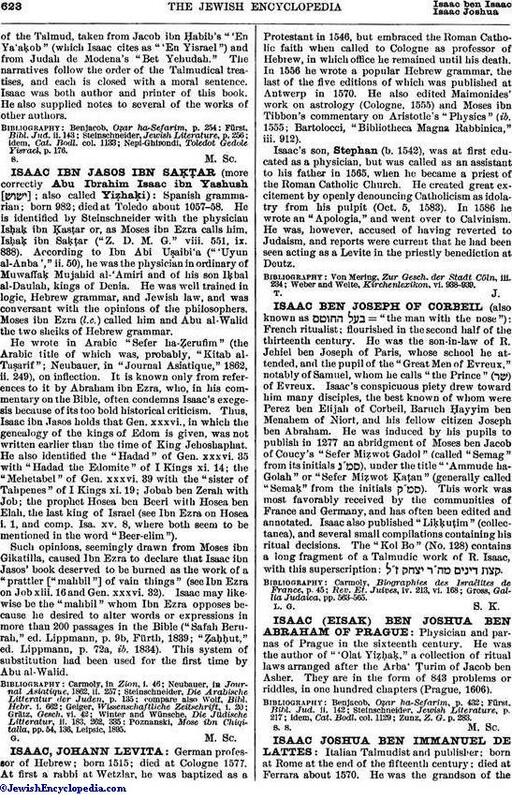 He was, however, accused of having reverted to Judaism, and reports were current that he had been seen acting as a Levite in the priestly benediction at Deutz. Weber and Welte, Kirchenlexikon, vi. 938-939.